pistachios, cashews, choc. chip mini cookies, butter toffee peanuts, choc. 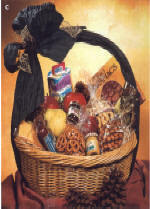 raisins (milk or dark), jelly beans, boysenberry cookies (bag), apricots pineapples caramel pretzels, choc. non pareils, choc. malt balls, choc. 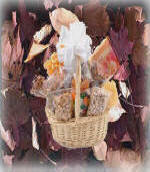 wafers, popcorn (choc. or caramel), choc. pretzels, choc. macadamia (box), Dutch mints, choc. espresso beans, walnut choc. cookies (box), petit-biscuits, lady fingers cookies (bag), Brent Sam's cookies, choc. 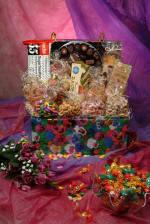 fortune cookies (box), choc. chip cake. choc. macadamia (box), Dutch mints choc. espresso beans, walnut choc. cookies (box), petit-biscuits lady fingers cookies (bag). Pistachios, cashews, choc. chip mini cookies, butter toffee peanuts, choc. 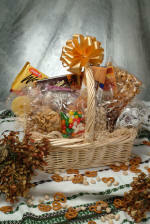 raisins(milk or dark), jelly beans, boysenberry cookies (bag), apricots pineapples, caramel pretzels, choc. non pareils, choc. malt balls, choc. wafers, popcorn (choc.or caramel). fudge candies Dutch mints, go den pears, European imported preserves Hawaiian style taffy, summer sausage, pistachios, chocolate covered macadamia nuts and more. It's a feast to remember. Give one of the great pleasures of the season. 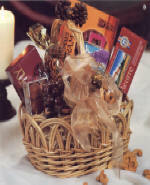 This irresistible gift basket is perfect to serve when the house is full with friends, relatives, loved ones or business associates. 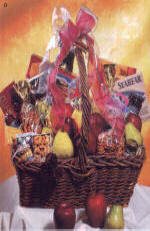 This basket is filled with almonds, smoked salmon, chocolate espresso beans, European imported preserves cheese, Caribbean exotic cookies, apricots, chocolate malt balls, praline nut com Dutch chocolate mints, cashews biscotti cookies, pistachios, caramel pretzels, chocolate walnut cookies, imported French biscuits, summer sausage, mustard, chocolate Jordan almonds, chocolate macadamia nut cluster and more. biscuits, chocolate malt balls, caramel pretzels and gigantic pistachios. 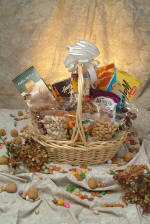 French biscuits, pistachios, caramel pretzels, chocolate malt balls and Caribbean exotic cookies. 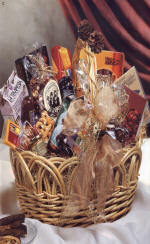 gourmet coffees, caramel pretzels, sausage, mustard, chocolate Macadamia nut clusters praline nut com, European jam, roasted salted pistachios biscotti cookies, milk chocolate almonds, Hawaiian style taffy Australian glazed apricots dipped in chocolate and much more. Let them enjoy the taste of juicy pears, complete with delicious assortment of cheese, cookies, butter toffee peanuts, rosy red apples, smoked sausage, mustard, caramel pretzels and pistachios. 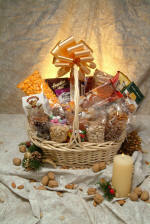 nut clusters, caramel pretzels, cheese and crisp apples. Here's a gift of nature's perfection to enjoy. 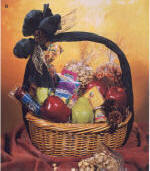 From the orchard to you delicious apples and plump golden pears together with a bundle of goodies that includes chocolate Jordan almonds, gourmet cheese, gigantic pistachios, chocolate covered espresso beans, summer sausage, gourmet mustard, Dutch mints, jumbo cashews, jelly, caramel pretzels, exotic Caribbean exotic cookies, butter toffee peanuts and chocolate caramel Macadamia nut clusters. Pistachios, cashews, choc. 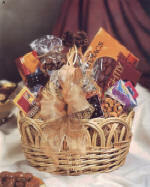 chip mini cookies, butter toffee peanuts, choc, raisins (milk or dark), jelly beans, boysenberry cookies (bag), apricots, pineapples, caramel pretzels, choc. non pareils. 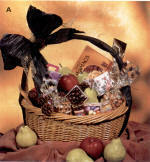 Assorted chocolates, large wafers, decaf tea box, focaccia bites, baguettes roasted/salted cashews, roasted/salted pistachios roasted almond apricot, unsweetened papayas, unsweetened mangos jelly bellies Jordan almonds mint cream crunch caramels fruit chews and a popcorn bag.